We aim to have a positive impact on the environment wherever possible and do this in a variety of ways. REDUCE We are constantly looking for ways in which our fuel consumption can be kept to a minimum and we ensure that our equipment is maintained and updated where necessary to assist with this. We also aim to keep any waste products to a minimum. We dispose of chemical waste in an appropriate manner and avoid the use of environmentally damaging chemicals, using suitable less harmful alternatives. chips to add flavour to barbeques. move them to a more suitable location. species for suitability to the site and for their appearance and characteristics. in some cases improving their aesthetic value. as a habitat for bats or bee colonies. 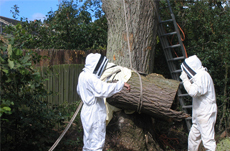 "Bee colony rescued from a dangerous condemned Ash tree in Longhorsley, Northumberland and moved to a new site in the village."